Son of former Monks coach Rick Simonds, Steven Simonds has made a name for himself in the program he grew up around. Steven Simonds has been a Monk all his life. He’s the son of former St. Joseph’s men’s basketball coach Rick Simonds, who led the Monks from 1980-92 and 1994-2003. Steven grew up running around the old gym at St. Joe’s (“The Chamber of Horrors” as he calls it), going on recruiting trips with his father and traveling with the team to distant locations from Idaho to the Virgin Islands. 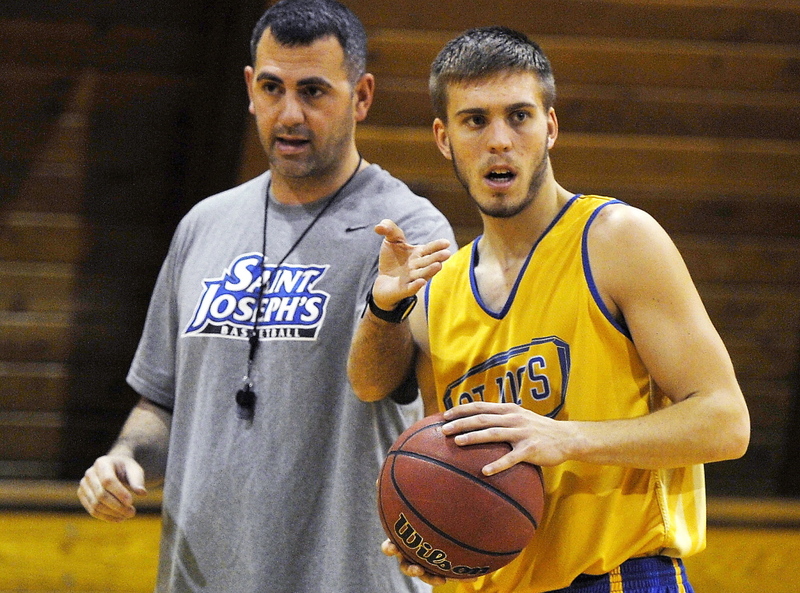 Rob Sanicola, now in his 12th season of coaching the Monks, was a baby sitter for Steven when Sanicola played at St. Joe’s for the elder Simonds. “Little Steven” is now a 6-foot-3 senior guard and the Monks’ leading returning scorer entering the 2014-15 season. Simonds said he was a “decent” player coming out of Bonny Eagle High who could shoot and pass the ball but still had holes in his game. As a freshman at St. Joe’s, he played sparingly, logging less than 100 total minutes. Sanicola suspects that at the time there was a perception that the young Simonds was on the team only because of his well-known father. Rather it was just a normal case of a young player needing time to mature and to learn what was needed to compete. As a sophomore Simonds averaged 12.5 points, 4.7 rebounds and 2.4 assists. Last season was almost a carbon copy: 12.3 points, 4.3 rebounds, 2.5 assists. St. Joseph’s went 18-10, 15-3 in the Great Northeast Athletic Conference a year ago and was ranked third in this season’s GNAC preseason poll. St. Joe’s opens its season Thursday at Husson. The Monks graduated their top two scorers (Matthew Medeiros, 18.8 ppg; Nick Jobin, 17.1 ppg) and have no player taller than 6-5. Zach Blodgett of Bangor, who averaged 9.6 points as a junior, has made a rapid recovery from a torn ACL. Fellow senior Jordan Tripp (3.1 ppg) and junior point guard Jerome Diggs are also key returners. While Simonds is expected to look for his own offense more this season, Sanicola emphasized that he does not believe in asking players to change their games. The Polar Bears return the 2014 Maine Basketball Coaches & Writers Association Player of the Year in 7-foot center John Swords (14.2 ppg, 9.7 rebounds). Swords was also the NESCAC Defensive Player of the Year as the Polar Bears went 19-6 and advanced to the NCAA tournament. Senior Keegan Pieri of Camden, a 6-6 guard/forward averaged 10.9 points and 5.9 rebounds as a full-time starter last season and is expected back soon from injury, according to Coach Tim Gilbride. This is Gilbride’s 30th season at Bowdoin. Having senior point guard Bryan Hurley back directing the offense is a big plus. Hurley averaged 9.4 points and 8.3 assists as a sophomore starter but missed most of last season with a torn ACL. Lucas Hausman, a 1,750-point high school scorer in Connecticut, moves into the starting lineup after averaging 9.5 points in only 17 minutes a year ago. The Polar Bears started 17-1 a season ago then stumbled down the stretch, losing in the NESCAC quarterfinal and then in the first round of the NCAA tourney. Freshman Blake Gordon of Brunswick got quality time off the bench as Bowdoin opened with a pair of nonconference wins last weekend. The Nor’easters already matched their win total from last season (1-24) by winning Saturday’s opener against Maine Maritime in their Roundball Invitational before losing to Middlebury 69-67 in the championship game. Leading returning scorer junior guard Devin Thompson (31 points against Middlebury) and sophomore Jean-Luc Parker should provide the Nor’easters with good backcourt play. Thompson averaged 13.9 points and made 41.8 percent of his 3-point attempts as a sophomore before a season-ending injury in the eighth game. Sophomore Sam Thomas (11 rebounds, 4 blocks vs. Middlebury) is a 6-9 presence down low for third-year coach Ed Silva, who once again is dealing with a young roster that includes seven freshmen, including Evrim Ozkan, a 6-8 forward from Istanbul, Turkey. CJ Autry of Standish (Bonny Eagle) is the lone Maine native on a senior-less roster. The Huskies are another team without a senior. Unlike UNE, they do return a solid core. Junior tri-captains Sean Caddigan of Bethel (Telstar), Cole Libby of Buxton (Bonny Eagle) and Aaron Toman of Gardiner all played significant minutes for the Huskies last winter during a 7-19 season (3-11 in the Little East). Zach Leal of York and Jacob Littlefield of Mechanic Falls (Poland) also saw plenty of playing time. Libby, who transferred from Endicott midway through his freshman year, is the leading returning scorer (9.5 ppg). His role is to be the playmaker. Leal, a 6-3 guard, impressed in an exhibition win against the University of Maine and scored 22 and 19 points in season-opening losses last weekend to Anna Maria and Connecticut College. Caddigan, the Mountain Valley Conference player of the year in 2006 who originally attended UNE (where he played golf), is considered a good 3-point shooter. Fourteen of Coach Karl Henrikson’s 16 players are from Maine. The Huskies are tabbed to finish sixth in the Little East. The Seawolves have been a high-scoring force in the Yankee Small College Conference and figure to be the same this year – though early indications are they can play some defense, too. SMCC went 21-9 in 2013-14, averaging over 86 points a game. The Seawolves are off to a 5-1 start this season for Coach Matt Richards in large part because they have held four teams to 60 points or fewer, while 11 players are averaging more than 10 minutes per game. Sophomore Atencio Martin of Kittery (Traip Academy) is the team captain and early season scoring leader (12.3 ppg). Josh Tuplin, a 26-year-old from Bath (Morse) who last played at SMCC in 2009, is averaging more than 10 points a game and leads the team in 3-point field goals (12 of 34). Freshman Grayson Waterman (Noble High) is another 3-point threat (9 of 23). Alexander Hartford of Naples (Lake Region) and 6-6 freshman Jack Tolan of South Portland are getting regular minutes.